Approved by Leeds Highways Department, I.C. 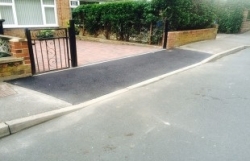 Ross are fully qualified to provide dropped kerb installation also known as dropped crossing and vehicular crossing in Leeds and lay pathways for all access purposes. Whether you are turning your garden into a driveway, we can provide a smooth finish to all dropped kerbs. With great industry knowledge and the best skills and tools required, we can always offer a high standard of service when providing any work. Whether your current driveway is uneven, bumpy or has high kerbstones that could damage your suspension, our dropped kerb installation in Leeds is always available. We can take your project from laying to adapting your current kerbstones. Our kerb stones can be installed whenever you require, with all uneven services put right. This can also include creating easier paths and access for your property. With 30 years of experience working on all projects, you can depend on us for a fantastic finish and installation. Have dropped kerb installation in Leeds today and contact I.C. Ross. We can also offer a range of other services for driveways, patios and fencing, ensuring your property exterior always meets expectations. To receive a fast response, fill in our contact form or call 07802 463 032 or 0113 260 3416 to make an enquiry.